The Functionality's temporary installation, "Feel It, Take It" disappeared last weekend. “We all have day jobs, and we don’t all live in the same city, or even on the same continent,” said Andrew Lyon, one of the six members of the multi-disciplinary design collective The Functionality. “But we all have a shared desired – to make something.” Lyon was standing beside Colin Harris, a civil engineer and fellow member of The Functionality. Huddled together against the cold last Saturday, the three of us barely fit inside W Project Space, a diminutive storefront gallery on a grubby block of Division Street, in a neighborhood that’s become a kind of lightning rod for just the kind of art practice the Functionality seems interested in pursuing: work that’s categorically messy, temporary, and site specific. Here, in the tiny storefront there’s a sixer of beer on the floor, half empty. Late ’90s hip-hop issues cheerfully out of the tinny speakers of a portable boom box. Honestly, anything louder would overwhelm the space. It’s like being invited to an art opening inside a VW Bus. 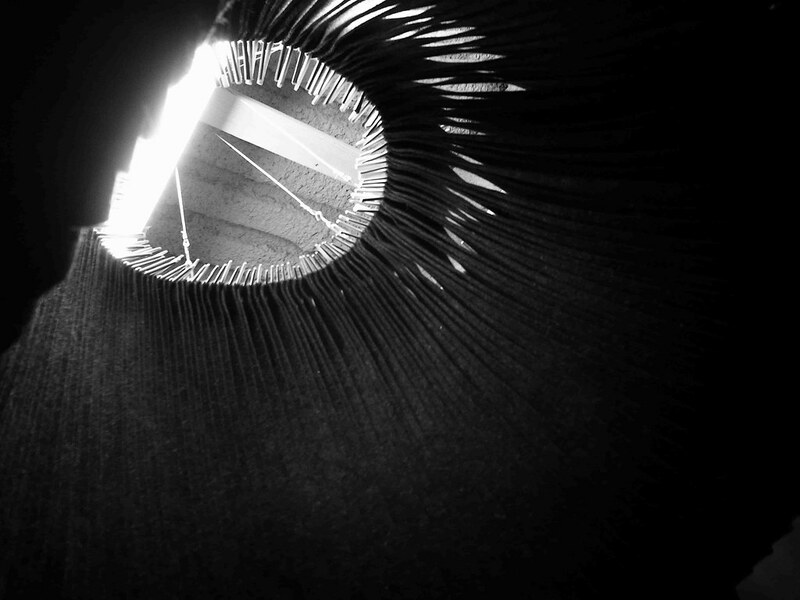 Over our heads hangs the reason for the gathering: a seductively tactile, monochromatic felt membrane entitled “Feel It, Take It,” designed and installed by The Functionality for a span of time as brief as W Project Space is small. A crowd begins to gather, drawn in by the vortex. The Functionality “explores issues of technology, culture and economics, through considered research and tactile experimentation,” according to the collective’s spartan website. Its members include architects, artists and engineers who treat the group as a counterpoint to the five-year timetables of institutional architecture, a venue for ushering something real into the world in short order. Something gone but never forgotten. Hence “Feel It, Take It,” an assemblage of 140 strips of felt—custom-designed and -cut scarves, actually. The form of the piece was created using procedural modeling software. 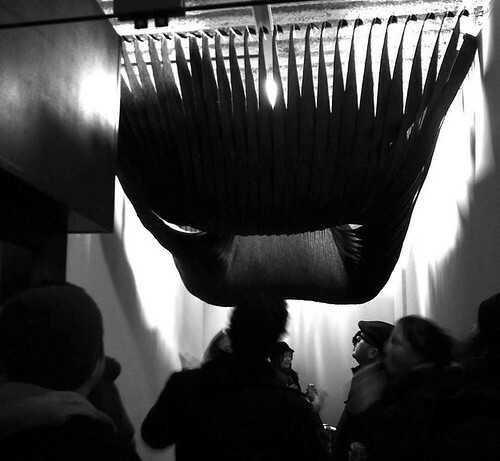 Formally organized along the graph of a catenary, “Feel It, Take It,” hangs from the ceiling of W Project Space, its form both alien and inviting. The idea is that tonight, at the end of the closing party (scheduled to take place one day after the opening), the installation will be disassembled and distributed to the attendees, each of whom will then disperse into the night. The work will dissolve into the city. Within minutes of my arrival, a stream of people began to descend on the miniature space, some invited by The Functionality, others just curious about the miniature gallery and the lovely object it contained. 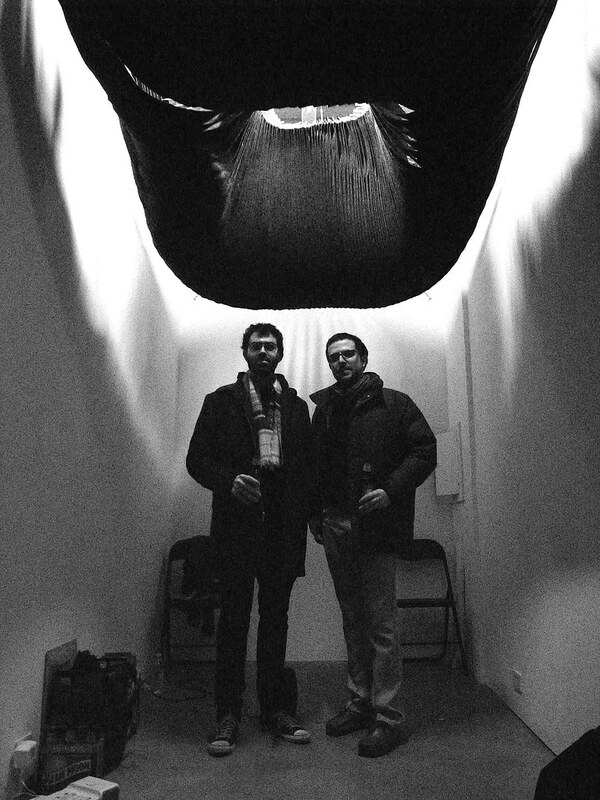 Within 30 minutes, around 50 people were jostling around the tiny space, sipping canned Pabst beneath the installation’s voluptuous folds. But as the moment approached to begin sending “Feel It, Take It” out, piecemeal, into the five boroughs, the city itself took dispersal into its own hands. It’s hard to fit so many architects into a space that’s roughly the size of a walk-in freezer without a little raucous spillover into the Chinatown night. As if on cue, a battery of NYPD cruisers converged on the space just before nine. As Lyon and Harris pleaded their case to a stony-faced sergeant—he was clearly not interested in generative processes or the beauty of interrelated systems—most of the crowd quietly evaporated. But what’s design without unexpected complications? An email the next morning announcing “Scarves for All” invited another (decidedly more tame) visit to W Project Space on Sunday to collect a scarf. For those who couldn’t make it, The Functionality will be making the felt strands available to anyone who sends postage and a self-addressed envelope, potentially increasing the distribution radius of “Feel It, Take It” by hundreds or even thousands of miles.